The superficial veins of the foot and leg interconnect to form a complex network below the skin. These vessels drain into two major trunks: the small and great saphenous veins. 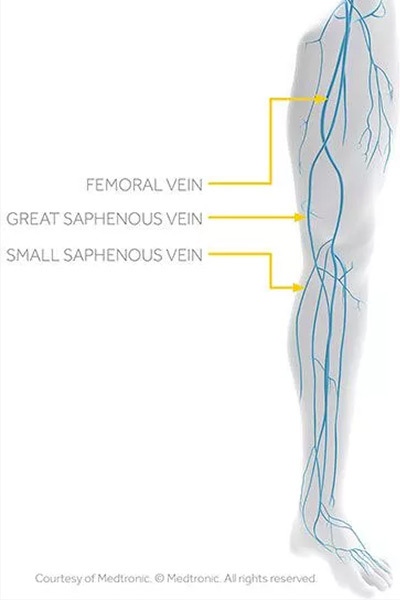 The "small saphenous vein" begins on the lateral portion of the foot and passes upward, rising along the back of the calf, enters the popliteal fossa (a depression in the bone behind the knee) to join the popliteal vein. The "great saphenous vein," which is the longest vein in the body, begins on the medial side of the foot. It rises to extend up along the inner side of the leg and penetrates deep into the thigh just below the inguinal ligament in the lower abdomen, where it joins the femoral vein. Near its distant end, it receives vessels that drain the upper thigh, groin, and lower abdominal wall. The great saphenous vein and the short saphenous veins, along with perforator veins are the veins most commonly affected by abnormal valve function. These veins are the focus of treatment in most patients who seek treatment for varicose veins.